What Nicolson does argue for is a much older tradition than was, in the past assumed. Many of the motifs of both poems come from a world when the Greeks lived on the steppes of Central and Eastern Europe rather than on the Mediterranean shore. The poems show these new, restless, tribal people erupting into a more settled, civilized, communal setting. The war at Troy is a struggle between the country and the city, between the patriarchal men driven by honor and the family men of the town defending their own. Compelling is Nicolson's exploration of the archaeology, language and history to build up this vision of different patterns of life in confrontation. Equally so is Nicolson's use of the contemporary study of gangs - their language and mores and the endless quest for status - to illuminate the lives of Homer's Greek heroes. But why continue to read Homer? Because the Iliad is a most compelling account, told from on high, of our own capacity for violence of which it is a vivid, brutal account and of how the countervailing tendencies of pity and of peace, longed for, intimated, so often crumple in the face of this need to dominate, overcome and in doing so shore up what is in essence a fragile if mighty ego. All challenges implies escalation, Nicolson shows, until a winner emerges even if the victory itself ratchets up the next occasion for conflict. It is a sobering dose of reality to our hopes. It is, also, if I may be permitted a Buddhist moment, a great demonstration of what David Loy would call 'lack' - the profoundly disruptive effect of unconsciously acting out our sense of a fundamental instability in our identity: of finding 'ourselves' by continuously asserting our superiority over an 'other'! 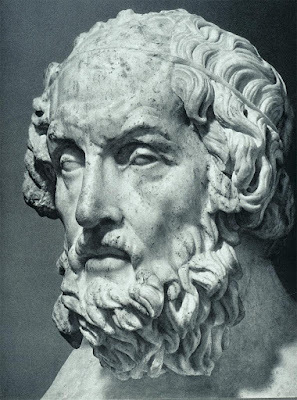 Because the Odyssey is a most compelling account of a myriad minded man (and in Penelope his accomplice and worthy counterpart) who seeks to find a renewing way of returning home from the bitterness of conflict. Here to find, ironically, through possibly the most brutal episode of both poems, a brutality that cannot be evaded, a domestic peace that is finally re-established. Wholeness is bought out of costliness. Life is transient and should be lived to maximal fullness for afterwards comes only a land of shades. We read Homer because, in truth, he is strikingly contemporary. He is so especially because he speaks from a time when 'life' appears to be all that is - immortality is only for the gods and that rare being elevated by the gods. Hades, where the 'soul' continues to exist is an unconsoling land of ghosts without apparent purpose apart from to lament the past. It is a brilliant, brittle vision of things to contrast wonderfully with the neighboring Egyptian that for most Egyptians was exactly the opposite - life was the endless waiting point, laboring after the elite, from which you longed for a more hopeful afterlife! I came away thinking that reading Homer was a beautiful invitation for looking out for what came next - namely the transformations of the axial age when this confined, if noble and intense, world is broken through with intimations of transcendence, a more democratic and accessible transcendence, the possibility of liberation from the suffering of transience -in Plato, in Zoroaster, in the Buddha. Whether that is a new glimpse of reality or a compensatory mechanism only each person can judge for themselves! But Homer's contemporary nature demonstrates that there is nothing new in our only living for the now for there is no then.